The first major exhibition of landscapes by L S Lowry since his death in 1976, took place in the summer of 2013 at London’s Tate Britain Gallery. The many fans of the great painter of industrial northern life, L S Lowry, flocked to Tate Britain making it one of the top ten art exhibitions of 2013. 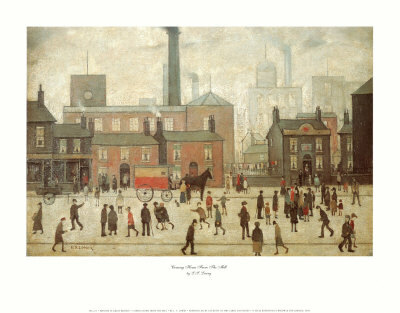 The Tate exhibitionconfirmed Lowry as Britain's most important artist of the industrial city and working class life. It focussed on some of the best known and loved industrial scenes and landscapes, many of which had been loaned from other galleries and private collections. This was an exciting exhibition for all those who appreciate Lowry's painterly record of aspects of northern English life that have now almost completely disappeared. Laurence Stephen Lowry became inspired by his surroundings to paint the people, culture and industrial landscapes of Salford and Manchester. Lowry is famous for his paintings of working class life in England’s industrial north. His most well-known, but by no means his only creations, show ‘matchstick’ men, women and children stoically measuring out their days by trudging to and from work, playing, marching, fighting, coping – without sentiment, condescension or moral judgement. L S Lowry, an only child, was born in 1887 in Manchester. His father, Robert, a quiet man, was an estate agent and his mother, Elizabeth, an accomplished pianist and a collector of clocks and china. The couple had few friends and Lowry learned to become accustomed to solitude. He was in later life, by his own admission, a lonely man. There was an air of tension between Lowry’s parents – his mother resented his father’s lack of ambition and concentrated most of her affection onto her son. He, in turn, was extremely attached to his mother. “She did not understand my paintings”, he would say after her death, “but she understood me and that was enough”. Lowry left school at sixteen and eventually became a rent collector for the Pall Mall Property Company. This job would eventually provide him with living models for his work. Many of the tenants he became familiar with found a permanent home in his paintings. 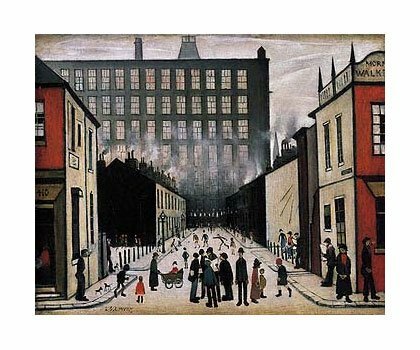 Walking through Manchester and outlying areas, Lowry grew familiar with industrial architecture, cobbled streets and the people who inhabited the narrow back-to-back houses. Lowry stayed at the Pall Mall Property Company until his retirement at 65. He was a loved and respected employee. Although Lowry’s paintings have been described as ‘naïve’ and untutored, this was far from the case. He chose to paint his ‘matchstick’ figures this way. From 1903 he spent ten years in evening classes at the Municipal College of Art in Manchester where he was taught by the brilliant but little-known French impressionist, Adolphe Valette, before moving on to Salford School of Art where he stayed until 1928. Although competent at drawing from the antique and from life, the core of his artistic life was to be the industrial world outside the art room. When Lowry was twenty-two the family could no longer afford to live in Rusholme and were forced to move to Salford's industrial Pendlebury district. This was a humiliating experience for the whole family. However, Lowry would take a notebook on his walks around the area. One evening in a kind of epiphany, he saw the Acme mill from the top of the station steps and realised that his life’s work was to be spent documenting the ambiguous beauty of the industrialisation around him. 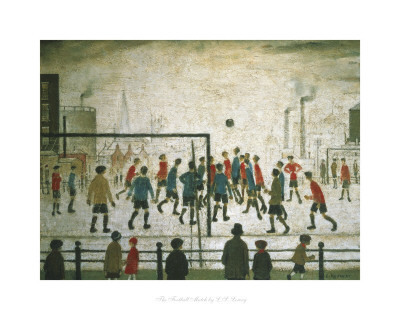 If you follow this link you can watch a really interesting short BBC documentary of the artist, Rolf Harris, painting in the style of L S Lowry. It's a fascinating glimpse into the life and techniques of Lowry. He admitted to being lonely. In 1938 Lowry was fifty. He had never had an intimate relationship with a woman and, although he had friends that he went walking with, he preferred to be alone. However, it would be a mistake to see Lowry as a man full of self-pity. He acknowledged his isolation – it was just the way he was and, as he himself realised, without his loneliness his artistic obsession may not have resulted in such compelling creations. His paintings give a psychological insight into his interior life. Lowry’s father had died in 1932 and the artist’s response was to paint a picture of an isolated, decaying house in the midst of a wasteland – a recurring theme. His mother was ill and Lowry had been her carer for many years. He feared her death and the resulting isolation and expressed his anxiety in an anguished self-portrait, Head of a Man With Red Eyes. In 1939, when his mother died, Lowry was devastated. In that same year he achieved his artistic breakthrough. After years of exhibiting irregularly and selling few paintings, a fortunate turn of events led to Lowry achieving the recognition he deserved. The London art dealer, A. J. McNeil Read, went into a framing shop where he saw some of Lowry’s works which the artist had left for framing. The result was that in 1939 Lowry was given a one-man show in London. The Tate bought his work, numerous exhibitions were organised, and his paintings were sought after. Never one to spend lavishly, Lowry did begin to visit the theatre regularly, go further afield (although never abroad) and to walk in the countryside with trusted friends. In 1948 he moved away from Pendlebury to Mottram-in-Longdendale on the edge of Manchester. He claimed to dislike the area and the house, yet stayed there until his death, welcoming reporters and students for interviews and happily accepting many honours, including membership of the Royal Academy. Such recognition touched Lowry deeply. L. S. Lowry died in February 1976, aged eighty-eight. His paintings depicting industrial life in the north of England recognise, without sentimentality but often with some brutality, the sadness and stoicism of a people deeply affected by the remnants of the Industrial Revolution. The Lowry Gallery in Salford Quays, opened in April 2000, is a permanent monument to L. S. Lowry, the people’s painter. Find out more about the Lowry Exhibition at Tate Britain by following this link. You can find out about The Lowry Gallery by clicking here. 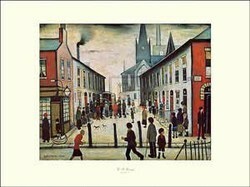 Love Lowry's paintings. Thanks for sharing his art. How wonderful the Tate is doing an exhibition of his work. Elias - thank you so much for that lovely comment. I do love writing about art and I enjoy looking at paintings - I guess it's the thing I enjoy most of all! Jo - I agree about Lowry - he's so accessible and people appreciate the way he has depicted their lives. Thanks so much for your post. I really like Lowry. I know little about art, but Lowry doesn't require me to. I can relate to the scenes that he paints, because I live in a similar (though modernized) world. Dora Carrington is now recognised as a significant British painter. This excellent book examines Carrington's life and features many examples of her varied output. Despite gloomy predictions about the railways, Turner's 'Rain Steam and Speed' used an optimistic, painterly language to depict the new mode of travel.